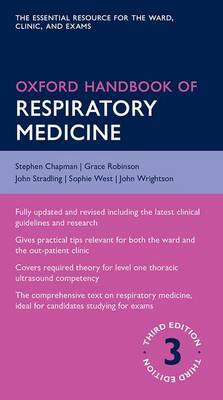 Revised and updated for its third edition, the Oxford Handbook of Respiratory Medicine is the must-have resource for junior doctors and students, and all clinicians caring for patients with respiratory problems. Concise, practical, and designed for rapid access to essential information, this handbook will ensure you have everything you need for the ward, clinic, or exams. This handbook covers the latest clinical guidelines and developments in the field. It features unique sections on practical procedures and a symptoms section to aid in differential diagnosis and clinical management. Practical advice on management is integrated throughout and a dedicated section on respiratory emergencies ensures you can cope with any eventuality. New sections such as thoracic ultrasound, indwelling pleural catheters, safe sedation, and cardiopulmonary exercise testing have been added, and all major respiratory diseases and symptoms are covered in practical, succinct chapters. This third edition will ensure you have all the information you need at your fingertips.